More than one thousand Commonwealth flags were raised around the world at 10.00hrs local time on Monday 12 March – Commonwealth Day 2018, in a shared celebration of this amazing family of nations that encompasses the globe. 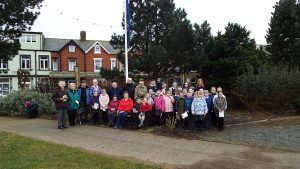 Silloth-on-Solway took part in the celebration, with the raising of the Commonwealth Flag in the Community Garden on Silloth Green. 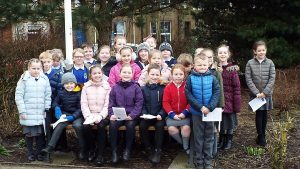 The ceremony was well attended, with pupils and staff from Silloth Primary School and Solway Community School, and representatives from other groups and organisations in the town. At 9.45am, Cllr. 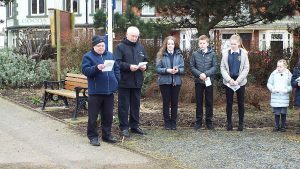 Graham Wilkinson, Deputy Mayor of Silloth welcomed everyone to the Flag Raising Ceremony. 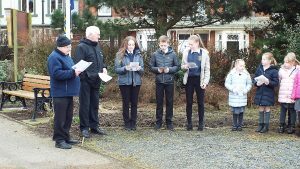 The Commonwealth Affirmation was read out by Becky Weightman, Ella Baker and Kia Orchard, Yr 9 pupils from Solway Community School. They were supported by Max Brough and Ben Mattinson, who read out the affirmation at the 2017 flag raising ceremony. Cllr. Wilkinson read out a personal message from the Commonwealth Secretary-General, The Right Honourable Patricia Scotland QC. “Fly a Flag for the Commonwealth is an occasion to acknowledge publicly and collectively the continuing aspiration of the Commonwealth to build on common traditions and uphold our shared values of democracy, inclusive development and respect for diversity.” At 10.00am, Cllr. Wilkinson raised the Commonwealth Flag, this being the fourth year of the event. The 2018 Commonwealth theme: ‘Towards a Common Future’, explores how the Commonwealth can address global challenges and work to create a better future for all citizens through sub-themes of sustainability, safety, prosperity and fairness, in line with the theme of the 2018 Commonwealth Heads of Government Meeting in London. This is so very true of the community of Silloth and something we can all be very proud of.